Voice Over Career? Get started in a career in voice over? Voice Over Acting Careers in Voice over, voice over careers, career in voice over, career in voiceover, how to get started doing voice over, voice career, voice over talent career Looking for Voice Over Career and How to get started in a Career doing Voice Over. Do you have what it takes to have a Voice Over Talent Career? Article: Voice Over Career? Get started in a Career in Voice Over? by Don Capone. Working from home and starting your own home business, in your home recording studio. Ok so your thinking about a voice over career... you've been told by so many people that.. you have a great voice and you should do radio imaging or try voice over... and you have always played with the idea... but never acted upon it... Well.. now you're here and reading this... so you have taken the first step... In this business we call voice over... you gotta have thick skin.. Remember its nothing personal.... errr... well maybe it is personal if your not selected after you do a voice over audition...after all you are the product... your voice IS the product your selling!!!... but remember... this is still a business... that is mostly run on a few things... Your God given Voice Talent... Who You know... and How you market yourself... and of course if the client likes your voice!!!! So your looking for a career in voice over... Fist thing first... Voice training and practice...every chance you get ..pick up something... anything... and read it out loud... listen to the commercials that are played on radio and TV and emulate the way you hear the voice over artist say it... There are many different styles... so first look for a style of speaking you are comfortable with... and... Practice, Practice, Practice... I even recommend taking acting classes. Advertisers are looking for voices that motivate, inspire or tell a story about there product. There may be character voices needed for an animation project or radio spot. But whatever the call... all comes down to the voice actor to be able to "act". Acting and being able to deliver the type of read that the client wants is the key. If you want a career in voice over... your gonna need to buy some voice-over equipment... you can go dirt cheep like a USB microphone from either Samson, Editors Keys or Blue starting around $80 bucks... and you can use a free audio recording software like Audacity to make your voice over demos with to showcase your voice talent. This way you have minimal out of pocket expense to get your new voice talent career going.... BUT... this is just to cut your teeth on... Not recommended if you want your voice over to be the best they can be.... Places we recommend to buy voice over equipment in no particular order.. Chris Lewis at Sweetwater.com, BSWUSA.com or Nathan Eldred at Atlas Pro Audio or Warren Dent at ZenPro Audio ... 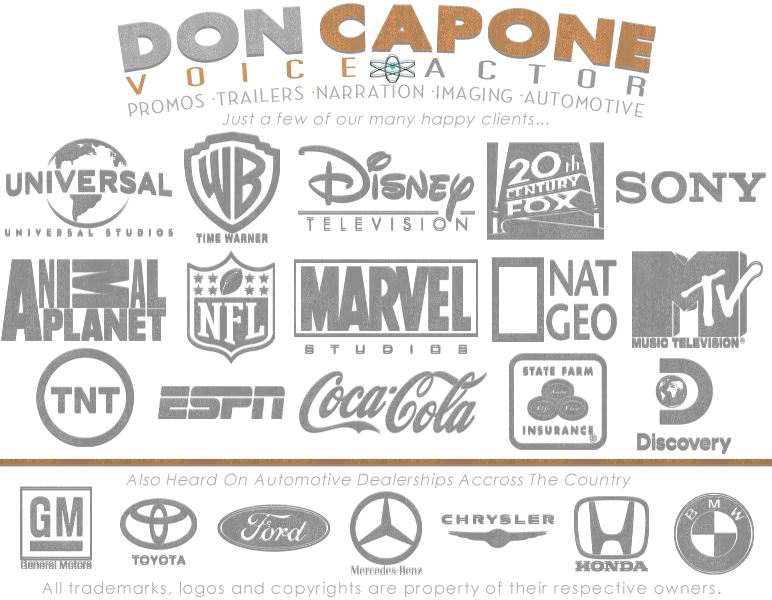 I "Don Capone" have personally made purchases from all these companies.. and there all great... a lot of voice talents will tell you that voice overs are done with 95% talent and 5% equipment... BUT... LISTEN CAREFULLY TO WHAT I SAY... In MY OPINION I believe its about 60% talent and 40% Equipment... this is why I stress it is very Very VERY IMPORTANT NOT to skimp and to have the highest quality voice over equipment possible... remember... garbage in...garbage out... save up and get the best voice over equipment possible! Click To see Dons --> Voice Over Studio Recording Equipment. Check out our Voice Over Studio to see what equipment we currently use. Ok so now you have practiced and purchased voice over equipment for you voice over career... and have made some voice-over demos... Now we need to get them heard.. buy the right people!... people looking for voice over talent... because you are now ready to get some voice over jobs. One place that come to mind for people who need to kick start their career in the voice over business is Voice123.com as I highly recommend this site. You can post your voice over demos there and people who are looking for voice over talent for projects can find you... We also recommend getting your own website that is dedicated to promoting and showcasing your voice over work. Do you even need a talent agent? Well... not in the beginning of your voice acting career... but most likely...as you progress, you will. Talent agents are the gatekeepers to the producers and casting directors who are looking for voice talent. Your talent agent should be franchised with AFTRA (American Federation of Television and Radio Artists), and also with SAG (Screen Actors Guild) ... visit these sites for lists of franchised talent agencies in your area.. and information in joining them...But I must stress... getting and talent agent and joining AFTRA or SAG costs a pretty penny...and is very extreme for someone just starting out.... so.. relax... focus... Got it?.. Get It?... Good! Since 1979 Don Capone has been in the voice business. Don Capone offers professional voice over talent services offering that bigger than life voice imaging that is needed to compete in today's corporate world. 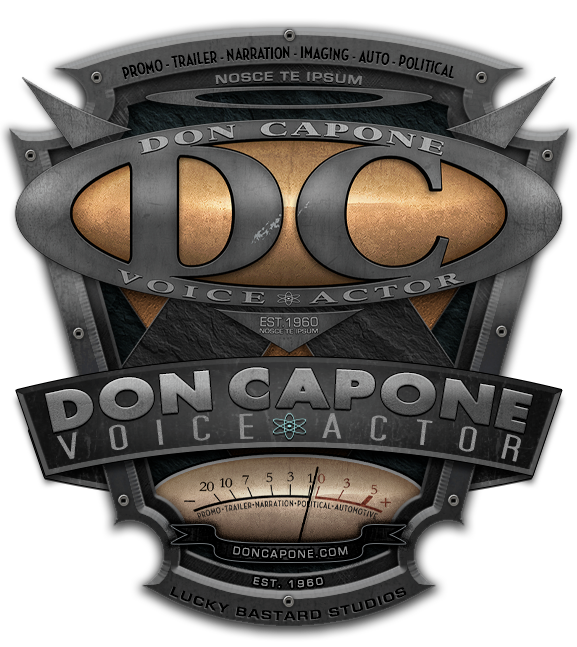 Voice Over Talent Don Capone is a professional Voice Actor. From Voice-Over LA to NY and the world. If you need Voice Over Talent for Movie Trailer Voice Overs, Radio Imaging, Narration Services to Commercial Voice Over Talent, then contact DC today. American English Voice Over Artist.